Almost 3 years since coup attempt! Mass jailing and the suspension of the rule of law by the Turkish government have produced thousands of victims. Among them mothers with their infants and older children. 17000 women and 743 children under age of 6, several thousand children aged 6-18 are being held in prisons in Turkey. Critics of Turkey’s policy noted, that imprisoned women and children were victims of guilt by association. Mothers and their children continue to be rounded up with other Turks following the July 16 coup attempt against President Recep Tayyip Erdogan. The country has been in legal “state of emergency” since then. One that allows the government to jail anyone believed to have ties to exiled cleric Fethullah Gulen and his Hizmet movement. Fethulland Gulen and his followers strongly denied alleged ties to attempted coup, and called for international investigation into it. 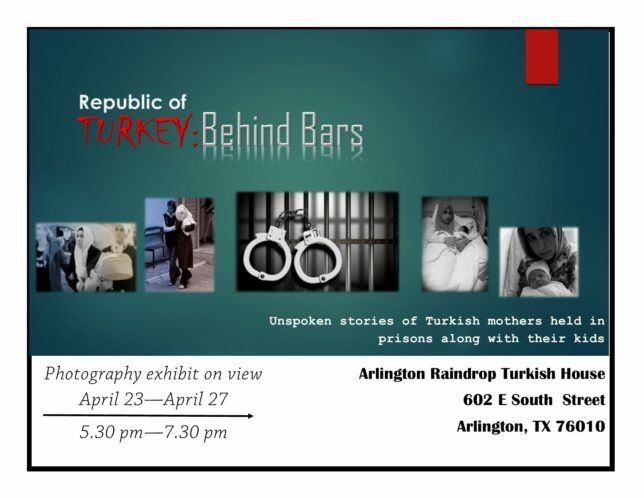 Please take time to RSVP at turkishhousearlington@gmail.com so we know approximate count of guests.